In the Pfalz/Palatinate, red wine cultivation has always played an important role, in addition to the famous Riesling vineyards of the Mittelhaardt area. Once dominated rather tender red wine varieties like the Portugieser, today the Spatburgunder/Pinot Noir is the number one. Everywhere in the Pfalz, wines can be found, which can compete with wines from any famous Pinot Noir growing areas in the world. Also Merlot and Cabernet show good results here. 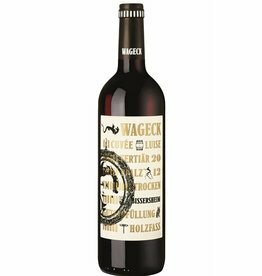 The best Spatburgunder wines are usually aged in barriques or traditional large wooden barrels, mainly from the slopes of the South Palatinate and the calcareous soils in the north of the cultivation area, where particularly elegant burgundian Spatburgunder grows that have a nice acidity and a cool climate taste, for instance the winery Wageck with its first-class red wines.